Let’s face it, bathrooms are an important part of our homes. They get a lot of use and they serve many functions. You want your bathroom to function well and look great. You want to be able to get in and get ready for your day but you also want to be able to enjoy that experience. That is why bathrooms keep advancing in fixtures, design, and lighting. If we can feel like we are at the spa while we prepare for our day, well that just makes the day more enjoyable. Here are several bathroom shower ideas to consider whether you are up for a remodel in a major or minor way. Out of all the rooms to remodel that pay off the most, the kitchen and the bathroom are usually top of the list because they get so much use and they provide so much enjoyment for homeowners and because when you go to sell your house, those are major areas that attract buyers. Bathroom showers have become an even more important feature than ever since so many people are opting for showers over baths, especially on a daily basis. Here are a few bathroom shower ideas and trends to consider. 1. Free Standing Shower Stall or Shower Enclosures. 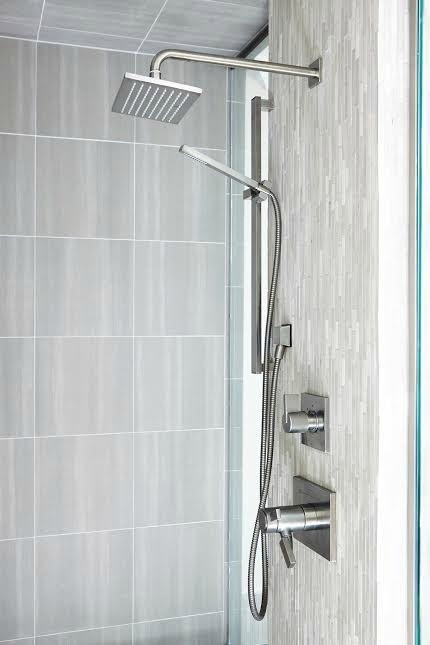 Free standing showers (without the tub attached) are becoming a very popular option because they appeal to many types of people. 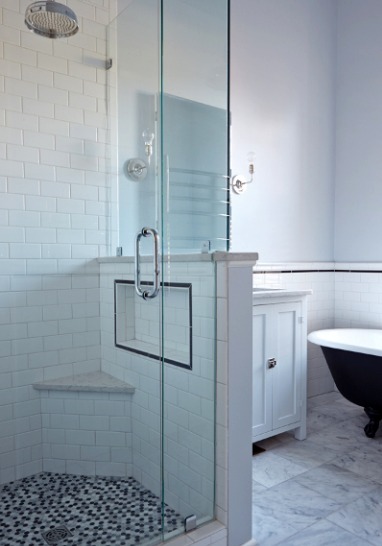 If you are looking to save space, a shower stall can take up less room than a tub. This is the case for us in the bathroom my husband is building in our basement. My husband ordered a corner shower stall and shower base online and he had a plumber do the pipes before he installed it. He is also doing tile work to give it a more upscale feel. 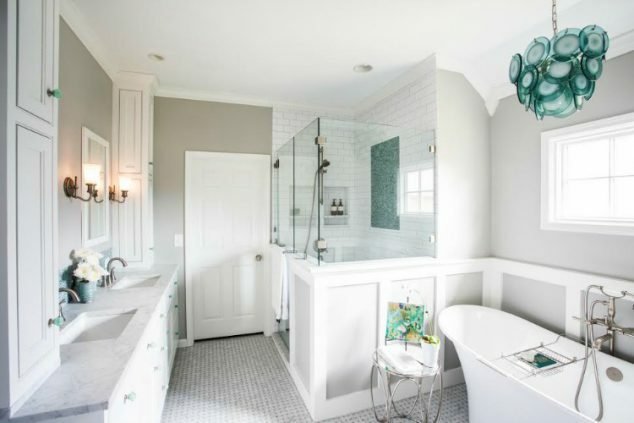 This gorgeous bathroom design was done by Sara Ray Interior Design and photographed by Alyssa Rosenheck Photography. A shower enclosure also appeals to those looking to create a spacious, luxurious feel for the bathroom. Shower enclosures can be all sorts of sizes and shapes and many people enjoy not having to step over the bathtub lip as well as having more options such dual shower heads. Frameless showers make your bathroom look bigger and help homeowners to age in place. 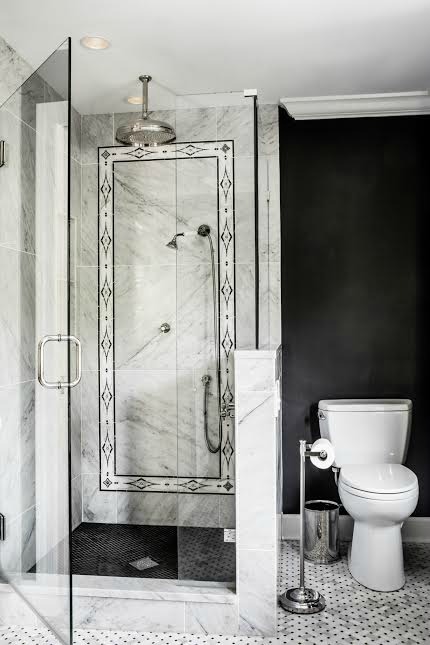 Black and white is a popular tile trend and I love the accents in this bathroom by Beth Haley Design and photographed by Andrea Behrends. 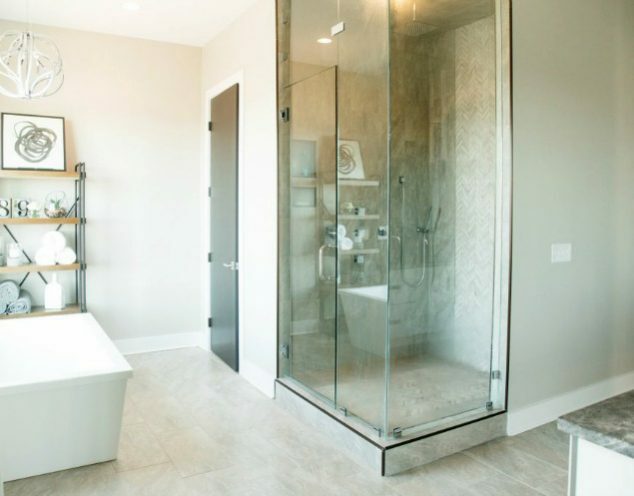 Rather than choosing a prefabricated shower enclosure, custom built tile showers are winning popularity because they can create such a beautiful atmosphere. Mediterranean inspired tiles can give a touch of charm and class to your bathroom. Fun tile shapes and patterns are popular right now as are accent tiles with a touch of glitz or metallic finish. Out of all these bathroom shower ideas, I just love the look of a fancy tiled shower. This beautiful shower from The Pleated Poppy features glass doors, dual shower heads, and pretty white tile. Glass shower enclosure and doors are the hot trend right now because they let in so much natural light and they allow the bathroom to appear bigger because there is no shower curtain blocking the view or distracting from the decor. 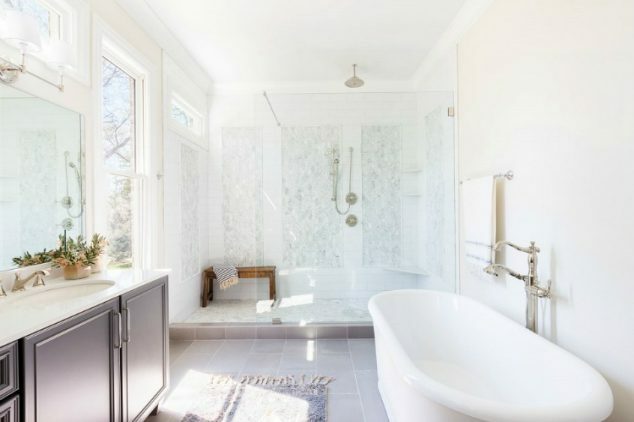 Bouldin Creek as featured on DecorExtra sure knows how to build an appealing shower! 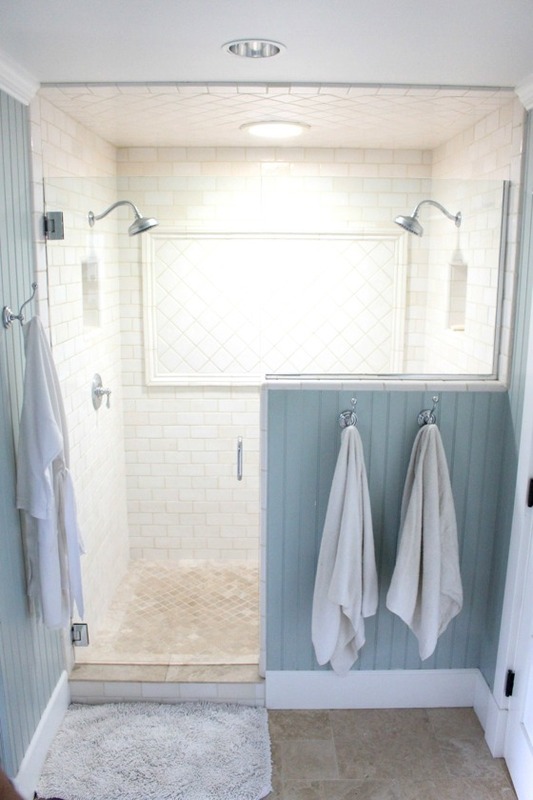 Body sprays, multiple shower heads, rainfall shower head, recessed shelves, and beautiful tile work. In HGTV’s article, 10 Tips to Increase Your Home’s Value, they suggest, “Upgrade your bath area. With an 85 percent return, install a shower with body sprays and stone surround tile. If you are not selling right away, you will feel like you are in a Zen garden every time you step into your bathroom.” Rainfall shower heads are a big trend to just get a really relaxing shower and body sprays are popular for a massage spa experience. Some people are even splurging on steam showers. 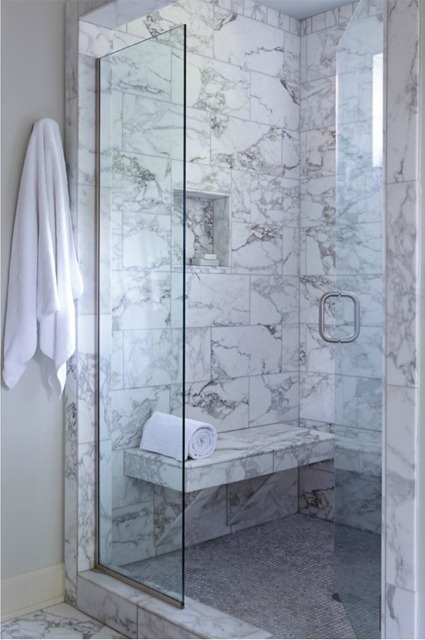 What an inviting shower with a seat to rest surrounded by beautiful Calacatta marble. This West Mead Cottage renovation was done by Sara Ray Interior Design an photographed by Reid Rolls Photography. Adding a seat to the shower, creates a relaxing place to sit and let the water wash over you. It can also be great for shaving legs. It is another of the bathroom shower ideas that helps with aging in place as well since it is recommended for most elderly. This is one of my favorite bathroom shower ideas. I love Roman showers. I so want one. The shower floor slopes slightly toward the drain so there is no rim to step over in a Roman Shower. I discovered this for myself many years ago in Rome! I went in the bathroom and there, in the corner, was the shower head- no lip, no shower curtain, no doors! 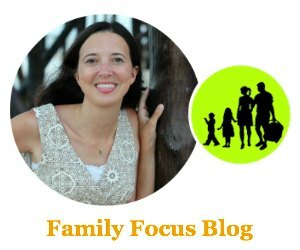 I was amazed and called my now husband, then boyfriend of 3 years into see it. He was raised in Italy so he saw no big deal but for me I was flabbergasted! They are gaining popularity and no door means less cleaning for me! We have all heard of singing in the shower but now you can sing along to speakers. You can even find showerheads with a built in wireless speaker that streams your personalized music playlists and syncs with Bluetooth enabled devices. Tech advances even include taking calls while in the shower (is that really an advance?- count me out) and color therapy lights! I love the gorgeous square shower fixtures in this clean, modern bathroom by Beth Haley Design. Photo by Reid Rolls Photography. Squares are a edgey look that will set your bathroom apart. They work well in modern, contemporary bathroom designs. It’s on trend to put lights in the shower instead of relying on the bathroom’s main overhead light. I love this idea and it can be executed in multiple fun ways to get your lighting just right or to add a bit to your decor. Houzz has some great photos to inspire you. I love the large recessed shelf and the fun stone mosaic blend on the shower floor in this transitional Victorian remodel by Beth Haley Design. Photo by Reid Rolls. A recessed Shower shelf is great for providing a place to store your bathing products and your luxe accessories. It is practical and it can add that finishing touch your bathroom oasis. I adore this Brentwood bathroom renovation by Beth Haley Design. Every single detail is perfect! Photographed by Andrea Behrends. Of course, now that you have the perfect bathroom shower ideas in mind, you will probably want to check out ideas for your free-standing bathtub as well! I hope you enjoyed these bathroom shower design ideas. Which ones do you think you will incorporate in your modern bathroom design?